Canadian Foreign Minister Chrystia Freeland is cutting short her diplomatic trip to Europe to head to Washington for trade talks with the United States. Freeland will fly to Washington on Tuesday after the Trump administration and Mexico said they have reached a preliminary accord to end the North American Free Trade Agreement and replace it. The administration still needs to negotiate with the third partner in NAFTA, Canada, to become part of any new trade accord. Without Canada, America’s No. 2 trading partner, it’s unclear whether any new U.S. trade agreement with Mexico would be possible. A spokesman for Freeland says Canada will only sign a new trade deal that is good for Canada. The Trump administration says an “understanding” to replace the North American Free Trade Agreement omits a provision Canada and Mexico opposed after the U.S. proposed it. Instead, U.S. Trade Representative Robert Lighthizer (LYT’-hy-zur) says periodic reviews will be required once a new agreement is signed. Lighthizer says the agreement will be in force for 16 years. But every six years will bring an opportunity to resolve issues or modernize aspects of the agreement. The parties then would agree to continue the agreement for another 16 years. Mexico is on board with that process; Lighthizer says he hasn’t discussed the new proposal yet with Canada. The U.S. had proposed that a renegotiated NAFTA die after five years unless all three countries agree to continue it. Canada and Mexico objected. President Donald Trump says he intends to terminate the North American Free Trade Agreement and call its replacement “the United States-Mexico Trade Agreement” — a name that would exclude the third NAFTA partner, Canada. Trump made the comments after announcing an “understanding” with Mexico that could lead to an overhaul of the 24-year-old trade pact, which Trump has called a job-killing “disaster.” Details of the U.S.-Mexico agreement were expected to be unveiled later Monday. The president says he will be calling Canadian Prime Minister Justin Trudeau. Trump says, “If they’d like to negotiate fairly, we’ll do that.” He also threatened to tax Canadian auto imports to increase the pressure on Canada’s government. 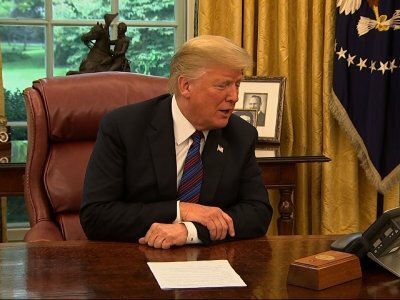 President Donald Trump says he’ll be “terminating” the North American Free Trade Agreement as he pursues a deal with Mexico and starts negotiations with Canada. Trump said Monday during an Oval Office event that he’ll be calling the emerging agreement the “United States-Mexico Trade Agreement.” He says it will mark the end of the NAFTA name. President Donald Trump is announcing a trade “understanding” with Mexico that could lead to an overhaul of the North American Free Trade Agreement. Canada, which is part of NAFTA, is not participating in the announcement. Trump says negotiations with Canada have yet to begin and is calling on the country to negotiate fairly. He’s threatening anew to slap tariffs on Canadian cars if they fail to do what he wants. Trump says the call is being held to “celebrate the understanding” the U.S. and Mexico have reached on trade. President Donald Trump says the prospects are “looking good” for an agreement with Mexico that could set the stage for an overhaul of the North American Free Trade Agreement. U.S. and Mexican negotiators worked over the weekend to narrow their differences. Once they reach an agreement, the third country in NAFTA — Canada — would be brought back in to finalize a revamp of the 24-year-old pact.